No obstructions along the top so that when you concrete you can keep the pipe just inside instead of lifting it out spewing concrete everywhere. All thick timber that can be screwed to easily and securely. No kickers, because they leak. 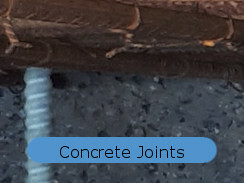 Nothing in joints except clean concrete the new concrete will bond to. 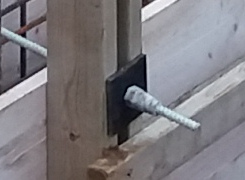 Screwfix turbo coach screws everywhere so that you strike the formwork easily and quickly without damaging the timber any further. 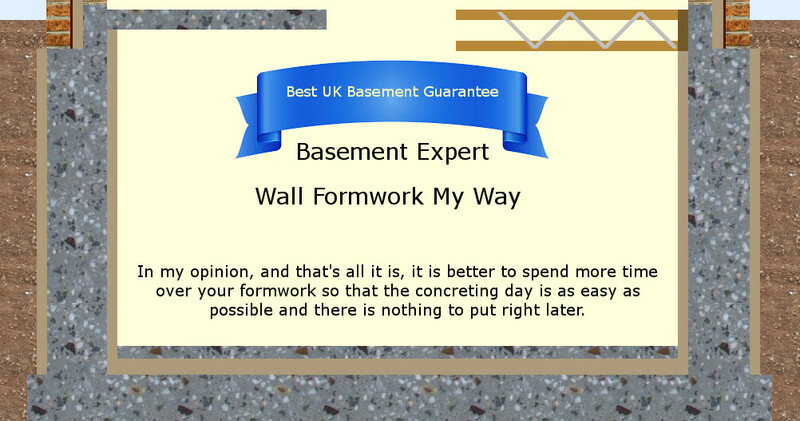 Walls formed and filled in two goes so that you get concrete right to the bottom in good condition and compact right to the bottom properly both times. Timber sold on or used again in your new house. In many ways, this customer was one of the best I ever had. You would do well to copy his example. He is a carpenter more used to loft conversions before he built this new house himself. 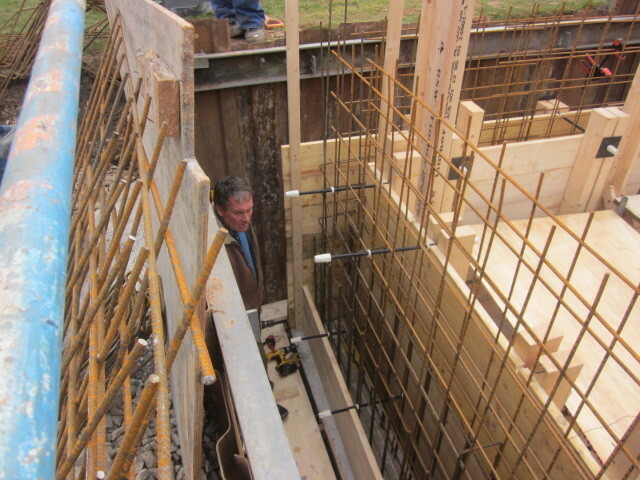 This is shortly before the first wall pour to about two-thirds height. There are no obstructions along the top. He can swing his concrete pipe between the faces of steel through the top without having to lift it right up which would make a mess. 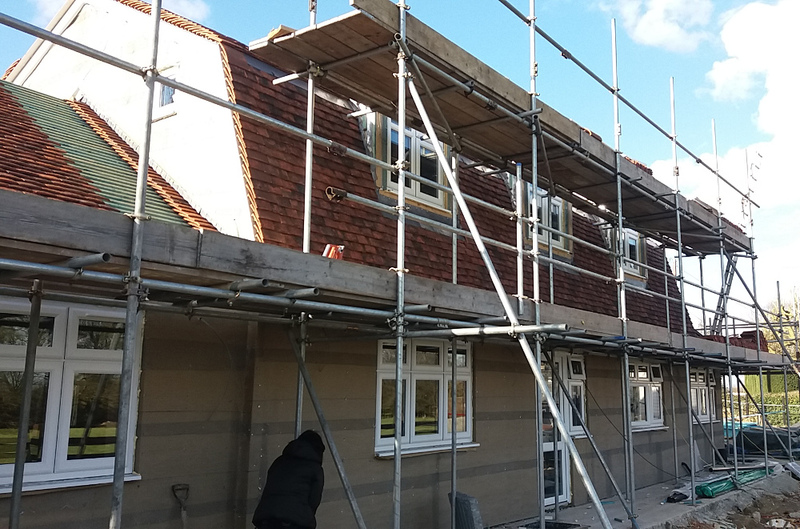 Good scaffold so the men can move around and poker safely. 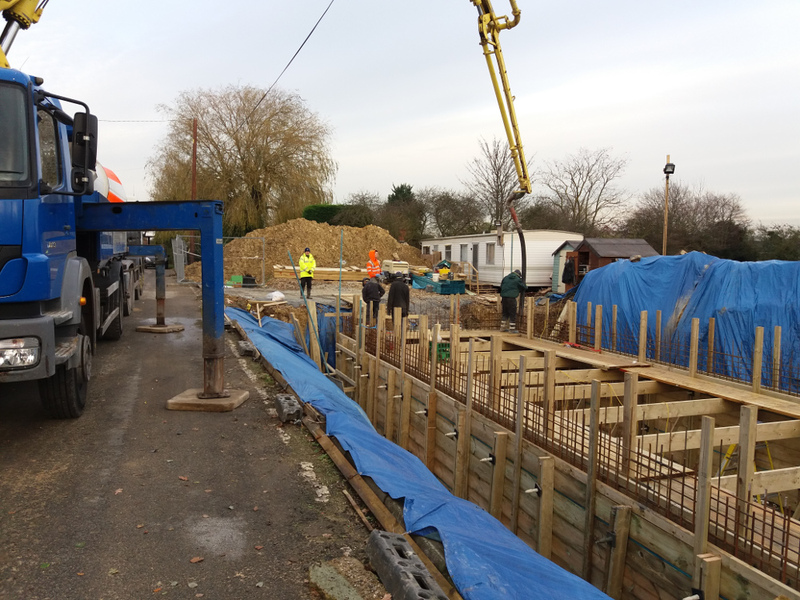 Only 1.7m deep in this case so the pipe delivers concrete to the bottom in good condition and the poker gets to the bottom easily with the operator only having to lift it 1.3m over the threaded rod to move it along. 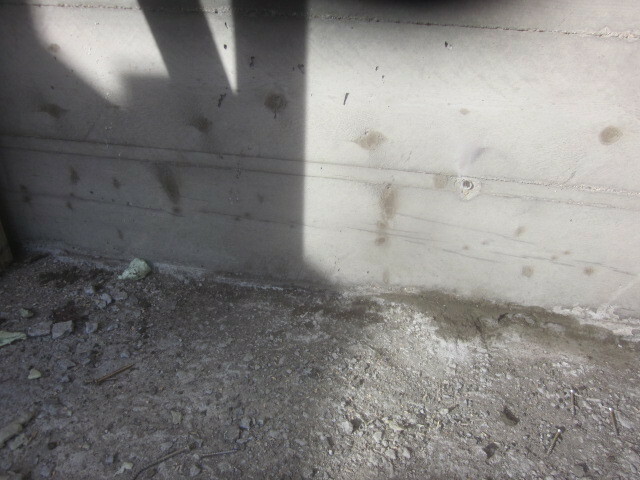 The slab concrete beneath the wall was scabbled and cleaned properly. 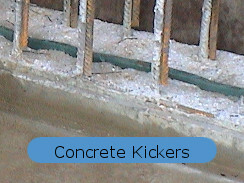 The wall concrete will bond to it completely and the starter bars through the joint will prevent any leaks from cracks. 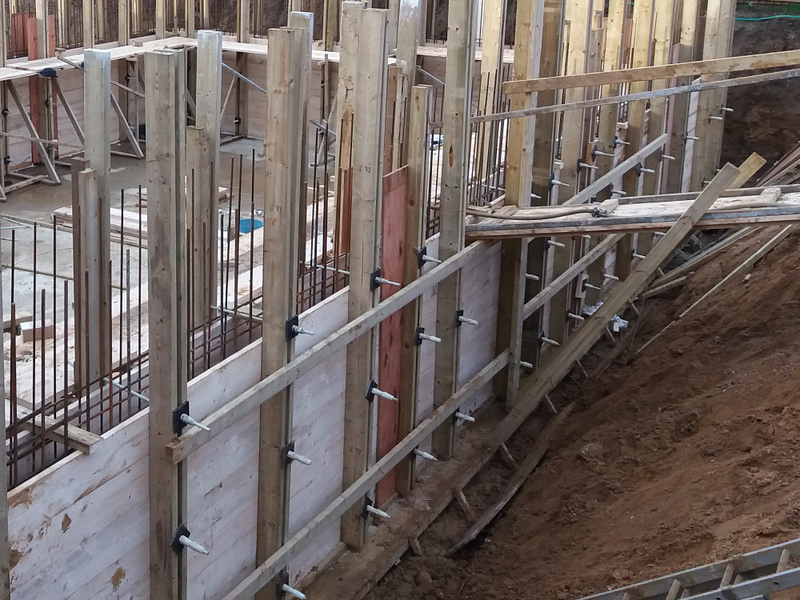 My next visit was just before the second wall pour. Because they limited the mess they made the first time, they found the time the same day to properly clean the timber after the first concrete pour. This helped him sell all the timber on. 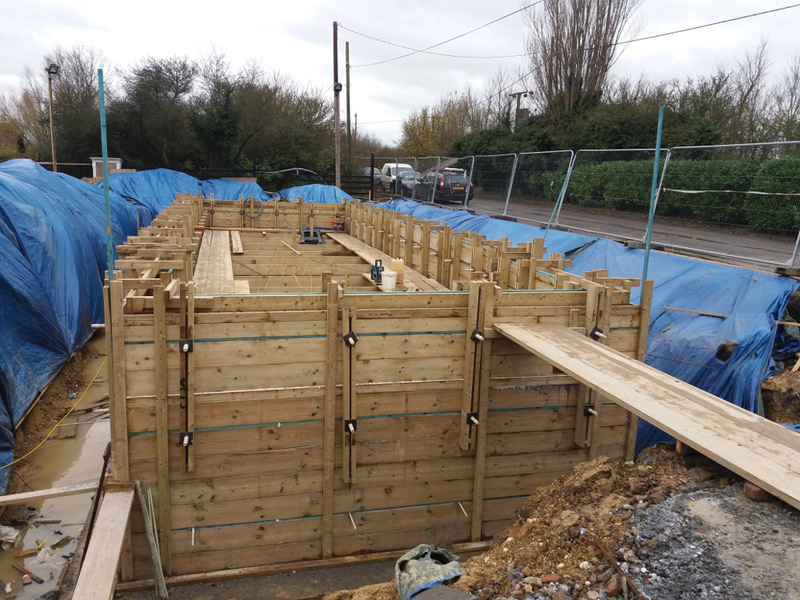 The blue lines are roof batten, Shorts lengths of batten with 18mm gaps between provide the holes for the threaded rods without drilling holes in the valuable timber that got sold on later. I notice that to help form his upstand at the top he used bits of timber over the top that would have got in the way when he trowelled off the top to the right level. Probably avoidable. He made one mistake, as it turned out, it wasn't something I had experimented with. He put the first row of rods two boards up. The first concrete tried to push the bottom boards out. This client bought loads of timber in packs from the docks, just like timber merchants do. When he sold smaller quantities to people who compared his price to that the timber merchants were quoting them, he got back what he paid despite a few screw holes. 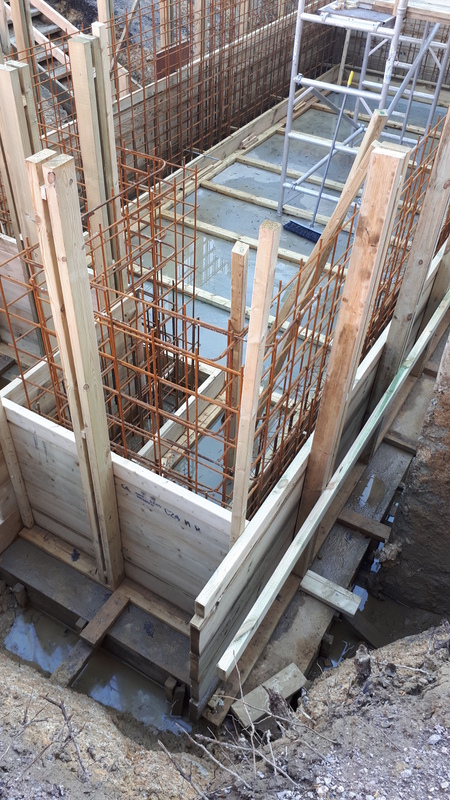 The formwork begins with screwing two pieces of 4x2 together to make an L shape. Use Screwfix 46700s. 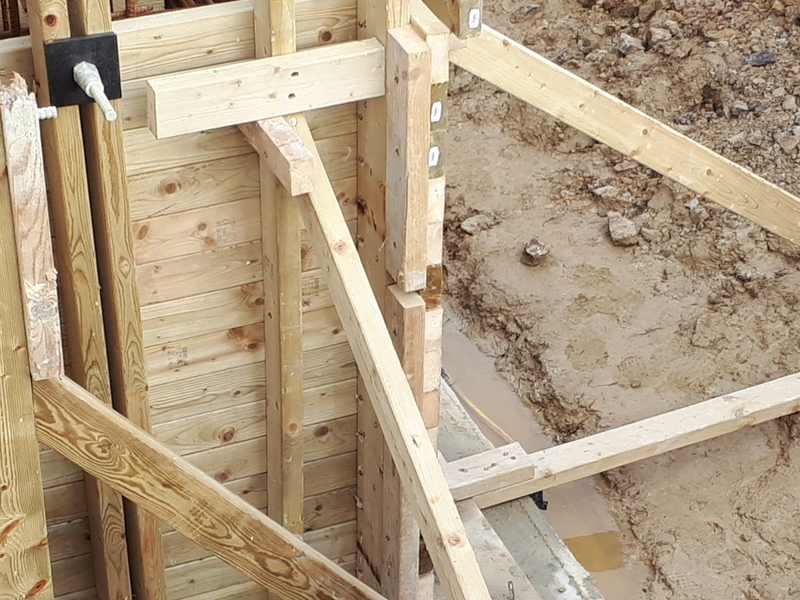 Then, with two other lengths of 4x2, triangles are made and screwed down so that the plumb face of the L is a board thickness off what needs to be face of concrete. This is where you do your careful setting out. 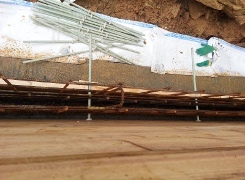 The formwork is held together with threaded rods and nuts. I cut the nuts down to make thin nuts that go inside controlling the concrete width. The first row of rods needs to be close to the bottom of the wall. 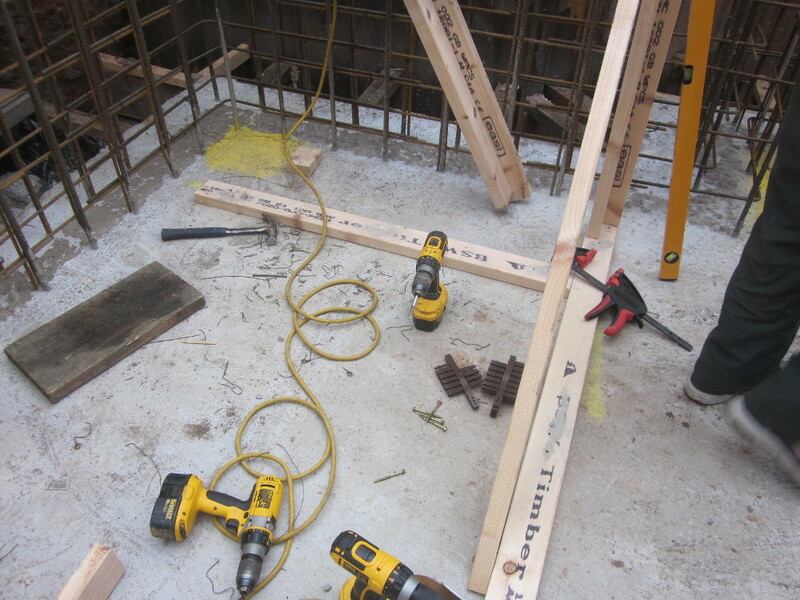 You cut through rods and nuts to remove the formwork. If you don't cut much nut off, you will be able to use them again. Or you can double up nuts increasing the chance of screwing them off. But unfortunately the frp is made never to come loose. 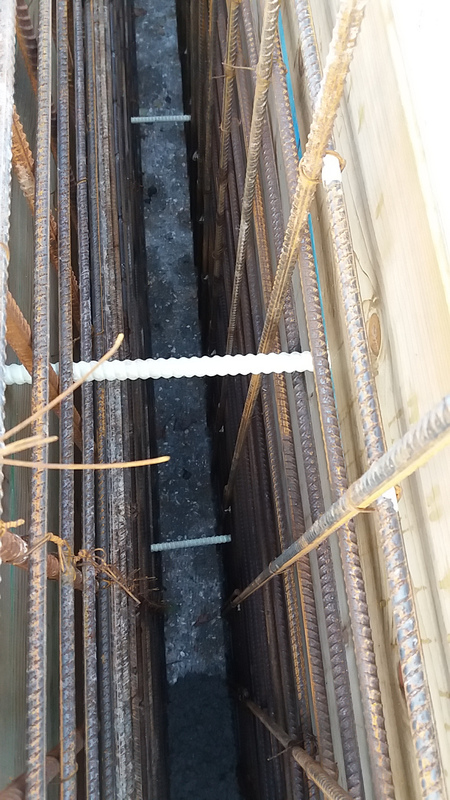 Elsewhere you will see how to use rods to get a slab level. If you do another basement you can save the offcuts of rod to re-use this way. If you let the boards outside one wall fly by, you can use a piece of 2x2 to screw the two forms together to make corners strong. The other screw lengths I use are Screwfix 25506s and 22717s. Put them in, take them out, with an impact driver and Screwfix 5169D. You might avoid cutting some standard lengths of timber. You might want to make corners even stronger. 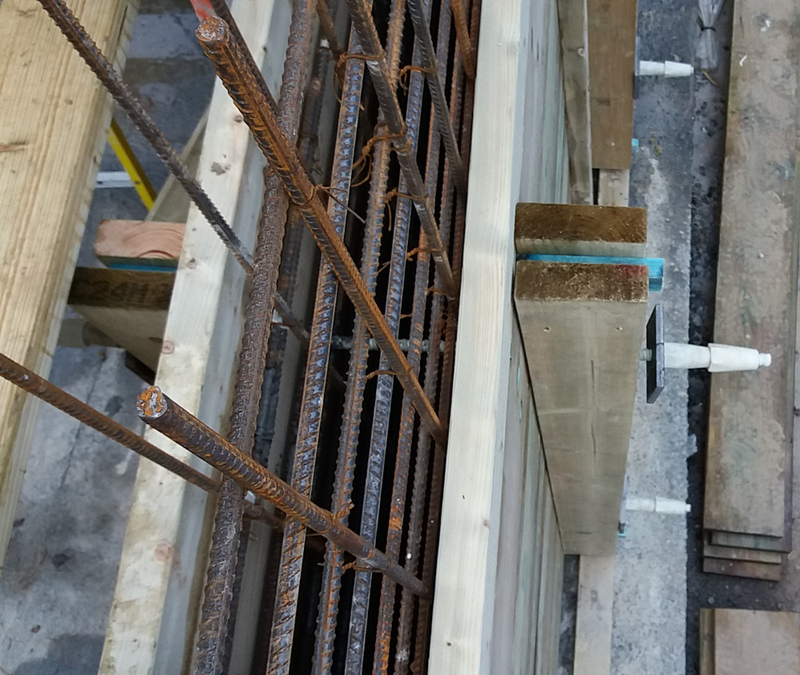 In some way, whether with ply or timber, you need to fix across joints in boards so the joints don't spread under the weight of wet concrete. 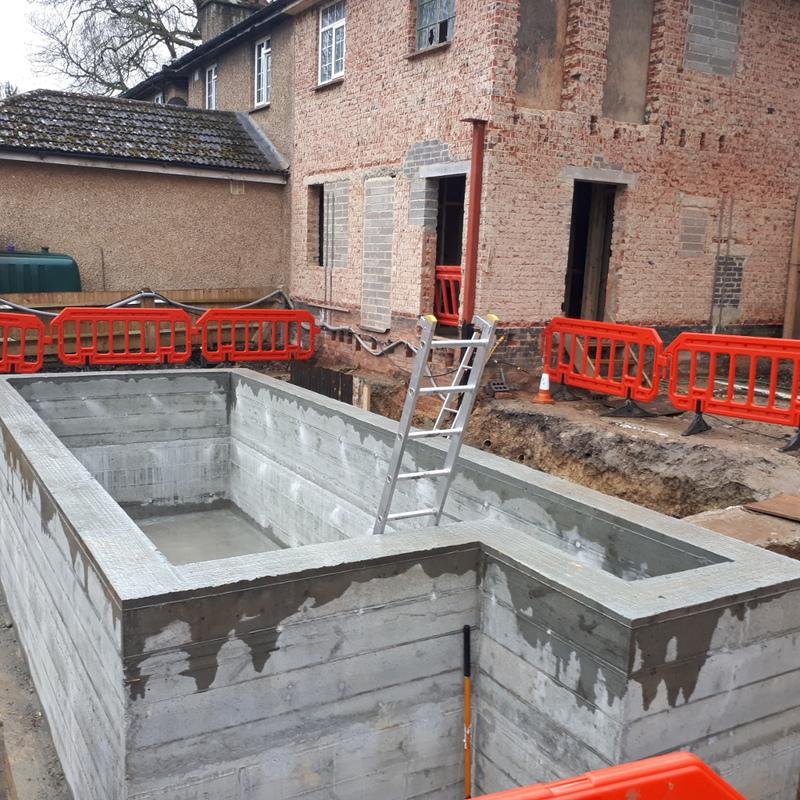 This building firm saw a self builder's basement. Studied these web pages then placed their order. I took this photo when I delivered the FRP threaded rods and nuts. 3 weeks later I collected the steel waler plates they hired. This is the completed job. If you want more explanation than you found on this page please use the "answer all your emails" service by paying for it. 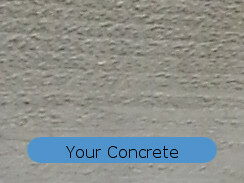 Bespoke formwork design is by quotation only.